It was a day that com­bined brains and brawn with cul­ture and com­pe­ti­tion in the name of ancient his­to­ry for Newtown Middle School’s Team Impact. As part of their study of Ancient Greek city‐states, stu­dents spent weeks explor­ing the many ways in which the cit­i­zens of Sparta, Megara, Athens, Corinth, and Argos devel­oped unique iden­ti­ties as con­trib­u­tors to both ancient and modern‐day soci­ety. Their stud­ies cul­mi­nat­ed in a day of sport and show­man­ship as the Team Impact Olympics were held on October 19 in and around the school build­ing. 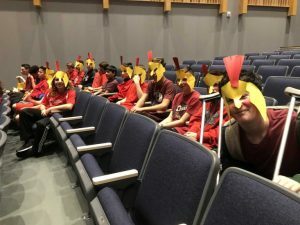 Organized by Social Studies teacher Mr. Bob McCarthy, the team assigned each home­room to take on the iden­ti­ty of a team of Olympians from a dif­fer­ent city‐state. Each home­room designed a flag to sig­ni­fy its iden­ti­ty, wrote a cheer to spur team spir­it and moti­vat­ed and coor­di­nat­ed a team uni­form. All of these artis­tic mas­ter­pieces were promi­nent­ly dis­played at the Team Impact Olympics open­ing cer­e­monies, dur­ing which the com­peti­tors from the city‐states were remind­ed about the ori­gins and pur­pose of the ancient games, the impor­tance of sports­man­ship and fair play, and the pur­pose that the games served for the peo­ple of each city‐state: shift­ing cit­i­zens’ focus away from bat­tle and war for a brief time. Once the long‐awaited games began, stu­dents com­pet­ed in events like a javelin toss, dis­cus throw, shot­put, hoplite relay race, and a game of quick‐thinking known as ‘Knuckle Bones’. Directed by city‐state lead­ers, stu­dents nav­i­gat­ed through the modern‐day Olympia, site of the ancient games. When the final scores were tal­lied, it was the city‐state of Sparta that proved vic­to­ri­ous in the over­all com­pe­ti­tion. The entire Team Impact com­mu­ni­ty came togeth­er in cel­e­bra­tion of one another’s tal­ents and abil­i­ties through the Olympic events, and their stud­ies came to life through a show of strength and smarts. Long live the Team Impact Olympics!